I’m still pulling notes together to create my monthly newsletter; this month’s topic is healthy eating. But what a huge subject! It was the topic at a recent retreat session, with a fun show-and-tell . The group got a “hands-on” experience, as I had packaged up 26 different food items, each representing a particular feature of healthy foods. It’s a process. Several years back, when I’d first heard about coconut oil, I bought a jar, stuck it in my fridge, and continued to ignore it for the next six months. No worries- coconut oil has a really long shelf life! I finally broke into it, eventually learning how to incorporate it into meals. Actually having healthy ingredients in the cupboard or fridge is the first step. Most will keep longer than prepared foods, so if you’re slow to begin using something, don’t be too discouraged. Remember: Progress, not perfection. 2. Oregano: Like spices, herbs are also full of antioxidants and other nutrients- most all are of high ORAC value (which means they’ll absorb those free radicals that can lead to disease and premature aging). You can make meals healthier just by adding a generous dose of herbs. 3. Chili Peppers, Paprika, etc. 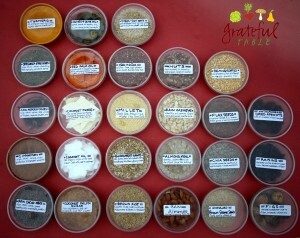 : Used as a spice, this “spice group” actually comes from various dried, ground peppers. As high as red peppers (and other family members) are in nutrients, their dried form is more concentrated. Extra nutrients! You can only use so much cayenne, but you can add paprika to color many dishes (even tomato sauce, soups, etc.). You’ll raise the nutrient level in the process. I look for organic, as peppers are on the dirty-dozen list. 4. Cinnamon: Most spices are excellent sources of antioxidants (and have high ORAC value). Cinnamon in particular should be on your radar. Like turmeric, it’s been thought to be of some benefit in treating early Alzheimer’s; also, it can manage low blood sugar too. I get “Ceylon” cinnamon, as opposed to Saigon or Cassia. The latter contain more coumarin, which could build up in the body, ultimately affecting the liver, in larger quantities. 5. Cacao Nibs: OK, you can put dark chocolate in the super-food category too (along with unsweetened cocoa powder). But the lesser-known “cacao nib” (which is the whole, raw form of chocolate) is actually pretty tasty too. Sure, some folks say the nibs taste a little like bark or gravel. Ha! I put them into confections, in place of chocolate chips, and really enjoy them. Some fancy chefs on the Food Network were adding them as a garnish on savory dishes. That works too! 7. Red Palm Oil: This bright red oil comes from the pressed, red fruit of the Red Palm Tree. Like olive oil, it’s been used in its unrefined form for millennium. It’s loaded with nutrients, with many health-giving features (see more info here). 9. Coconut Oil: Like the coconut puree, this has a list of benefits (see here). It can be added to various foods (oatmeal even), and can also be used in cooking. Add it to a hot pan when cooking veggies, to saute them, or heat the coconut oil a bit before adding spices to ethnic dishes. This oil has also been suggested as a potential treatment for Alzheimer’s patients. 10. Steel-cut oats: A notch above “rolled oats” as far as processing is concerned; since less heat is generated when the oat grains are steel-cut, and more nutrients are retained. Rolled oats have had more heat applied, when the hard oat grain gets pressed into that familiar flake. But either of these breakfast foods is superior to the standard breakfast cereals, from a nutritional standpoint. Most boxed cereals have been subject to high pressure, high temperature extrusion. This is how those cute shapes and designs are formed. (See more on extruded cereals here.) It’s a controversial subject, whether the high heat and pressure used to create most boxed cereals leads to a loss of nutrients. To be safe, you might eat some steel-cut oats now and then. Just add boiling water to a 1/3 c. of the oats, let soak until the next morning. The oats will cook much quicker that way, should you want to cook them a few minutes more in the morning. 11. Quinoa: This is actually not an grain but a seed, and it is gluten-free and high-protein. I personally love the red or black varieties, as they make an interesting addition to a meal. But the blond version is just as nutritious. You can start slow, just adding a sprinkle of cooked quinoa to garnish soups or other dishes; freeze the rest in little packets. Like many other seeds, quinoa has an outer coating of bitter saponins and phytates, so it should be rinsed well to remove those, before cooking. 12. Millet: This is a fun grain– it can be cooked like rice, or added to baked goods for a crunchy texture. It’s a nice change-of-pace “cereal” for breakfast (although it takes 40 minutes or so to cook…) It’s gluten-free, and a good source of B-vitamins too. 13. Buckwheat Groats: I love my buckwheat groats. They aren’t an actual grain, but a seed of the rhubarb family, and gluten-free. They are also soft enough that I can grind them in my little coffee/spice grinder, to make a “whole-grain flour” for pancakes. For a cooked side dish, they only take about 15 minutes to cook (plus 10 minutes of sitting). They can be toasted first, or not. Very nutritious! 15. Nuts: Brazil nuts in particular contain selenium, which can be hard to come by in our modern diet. Just a couple a day will provide what you need. But don’t overdue nut consumption- even though they are a whole food, and are far better than a bottle of polyunsaturated oil, they can upset the Omega 6 to Omega 3 ratio. It’s hard for us to get enough Omega 3 oils (found mainly in wild-caught salmon and such), and the more Omega 6s we eat (from nuts and other polyunsaturated oil sources), the more unbalanced the ratio becomes. Macadamias have become my fave nut, since they contain the least amount of Omega 6s. They contain more saturated fats, which, as it turns out, helps keep that Omega ratio in check. 17. Almond Meal: More from the “nut family”, almond meal can “sneak” into a lot of baked goods, adding extra fiber, healthy oils, and nutrients. Make a great crust for your next bar recipe, using some almond meal in place of cracker crumbs and such. 19. Beans: Beans have plenty of fiber, plenty of nutrients and protein, and they’re low-glycemic. Certain legumes (lentils, split peas, red lentils) will cook up quite quickly, making a fast, easy, but healthy meal. Pre-soaking will help to remove the phytates, which inhibit absorption of other nutrients. 20. Flax Seeds: It can be challenging to get the full array of essential oils as a vegetarian, but flax seeds are one of the few vegetable sources of omega 3’s. AND, they’re a #1 source for lignans (a great antioxidant, phyto-nutrient). But the oil can go rancid quickly; it’s best to fresh-grind flax seeds in a little coffee/spice grinder. Put in smoothies, or baked goods too- the nutrients hold up, even after being baked. Whoo-hoo! 21. Chia Seeds: What? Even good for your mood?! (See more here.) Chia seeds, like flax seeds, are a good source of Omega 3’s. And they can help sustain your energy– is that why marathon runners love them so? 22. Brown Sesame Seeds: Of course sesame seeds also have all the health-giving qualities of other natural, whole nuts and seeds. They make a nice garnish on top of dishes, or added to baked goods. But note that the brown, unhulled kind are more nutritious. Those cute little white ones have been bleached- not quite as wholesome. 23. Unsulphured Dried Apricots: All dried fruits have a more condensed nutritional profile. Unsulphured ones will not have as bright a color, but they will be more natural. Back in the 80’s, when I was pregnant and horribly anemic, the doctor’s iron supplements weren’t working. But I started drinking beet juice and eating dried apricots, and my levels went WAY up. Cool, right?! 24. Raisins: Ditto the above for dried apricots. And what a great way to sweeten oatmeal- not just a sweetener, but one with fiber and minerals too! Use this page for reference, if you’re wondering where to start. Take this list to the health food store, stock up, and begin your journey to healthier living! Look for organic whenever possible, as foods grown organically will be more nutritious. And it’s a great way to show support for all the farmers out there who are trying to avoid pesticides and chemicals. That should be enough info the chew on for now! 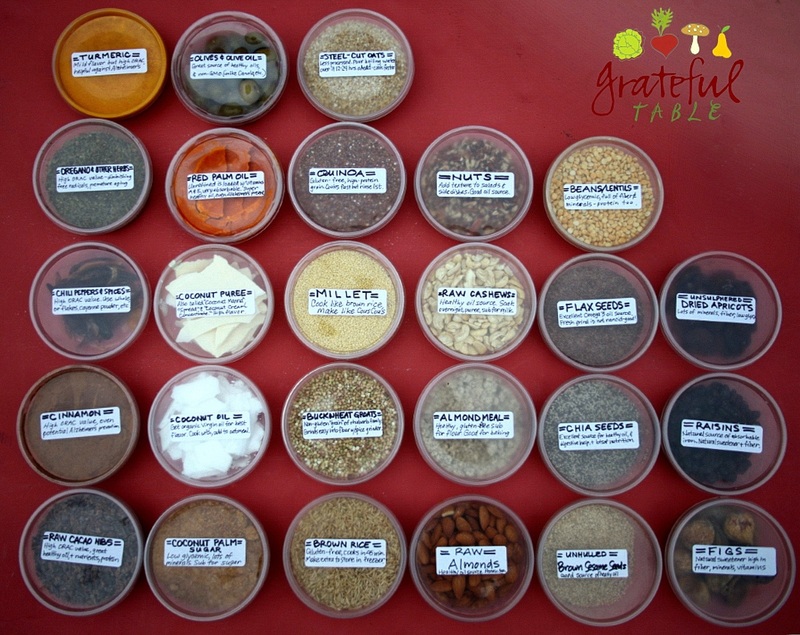 Get Future Grateful Table Posts in your Inbox! Be the first to receive posts with New Recipes, Cooking Tips, Contests, Promotional Gifts and More! Subscribe to the comments for this postGet notified of new comments on this post. If discussion generates more than a few emails daily your subscription will be paused automatically. Receive new posts direct to your Inbox! © 2019 GratefulTable.com. All Rights Reserved. Custom WordPress Website by Blogging Bistro, LLC.